Yesterday I had the pleasure of presenting to the librarians at Western Kentucky University during their 2011 kickoff event. When discussing a topic with the Dean, I was told that they were interested in the future of the academic library, technology, and how to manage the changes that are coming. That’s definitely in the sweet spot of my library interests, so I gave it a shot. Below you’ll find a slideshow with accompanying audio of my presentation, along with the Q/A session at the end. The whole thing is about 1.5 hours, but my presentation is just the first hour or so. I’d love to hear what you think, especially if you disagree with any of my points. Here are my slides from the Mississippi State University Libraries Emerging Technologies Summit 2010. They very graciously asked me to keynote the Summit, and I’m hoping that the talk was thought provoking and helped kick off what looks to me a really great day of programming. If you have any questions, please leave a comment and I’ll make sure to find the answer! I have, basically, three kinds of data that I’m worried about protecting in some way: working files, files that are important but replaceable, and files that I can’t afford to lose at all. Working files are just that: files that I’m currently working on for whatever reason. Might be a photo I’m editing, or a document, or an MP3 that I need to move to another computer…anything that requires action. Files that are important, but replaceable, are things that make my life easier if they are in digital form, mostly media. DVDs I’ve purchased and CDs I own have all been digitized, because I want to be able to watch them when I want and not when I remember to have a disk of plastic with me. I also want to be able to move them to my iPhone or other portable media player. If I lose the digital, it’s ok, because I can just re-digitize them, but I really, really don’t want to have to do that. And finally, there are the files that I just can’t lose for any reason. Things like tax returns, photos of my daughter, receipts, and other digital items that need to be safe even if there’s a natural disaster. So how do I handle all of this? With one piece of hardware, a few pieces of software, and broadband. Go read the whole thing if you’re interested in how I handle MY digital life. This is just awesome. I love the details in the reporting, like the fact that it takes 2 hours for the newspaper to download! Shows how far we’ve come. Also, I <3 acoustic couplers. 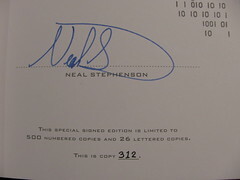 Betsy surprised me a few days ago with this, which she claims is either a late birthday or early father’s day present: a signed, numbered, limited edition of Snow Crash by Neal Stephenson. It’s put out by Subterranean Press, and is gorgeous. Subterranean is a press that specialized in high quality printings of limited edition fantasy, scifi, and horror…I want to own nearly everything they print. 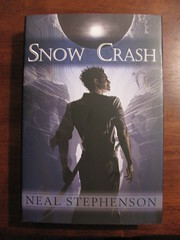 But for now, I will just stare and covet my copy of my preciou….I mean, Snow Crash. Really amazing graph generated using Lastfm Extra Stats that analyzes my music listening habits for the last 3 years. I’ve been using Last.fm to track my iTunes and other listening, and it’s really cool to be able to drag that data out and see it in graph form. Very, very cool little program. Thanks everybody, I’ll be here all week. Try the veal. If anyone hasn’t heard about the Swarm of Angels project, they just started their movie poster contest, and it’s a great time to read up on the project and get your fingers into some Open Source movie making. NB: I’m a Angel…joined 5 May 06, and if the “user count” on the URL is correct, I was Angel #29. Crazy! 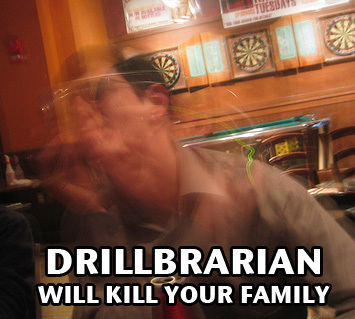 Thanks to Jessamyn for directing me to lolbrarians.